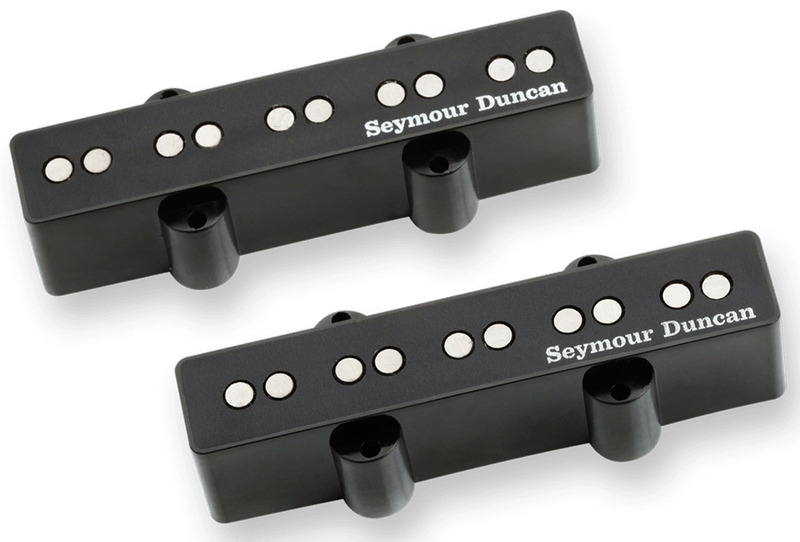 The Seymour Duncan Apollo Linear Humbucking Pickup Set for 5-string 'Jazz V' bass adds punch and articulation missing from standard Jazz bass pickups while minimizing noise. The Apollo 5-string Jazz Bass pickups have a traditional look, but the punch and power they deliver is unique to Seymour Duncan. A pair of side-by-side coils are used to produce hum-free performance with lots of body and attack all the way down to the low B. This matched pickup set uses the cover size of traditional 5-string Jazz Basses. If you have an older 5-string Jazz Bass, use the 70-74 model for the proper fit. Comes with black cover. Hand built in Santa Barbara, CA, Apollo Jazz Bass pickups use hand ground alnico 5 rod magnets and are vacuum wax potted for squeal free performance.